Faralda is an Altmer sorceress living at the College of Winterhold. She is the guardian who initially stops prospective students and requires them to cast a spell as a demonstration of their abilities. She specializes in teaching the school of Destruction, and starts the quest to obtain the most powerful Destruction spells once you reach 100 skill. Once that quest is complete, she sells the most advanced Destruction spells in the game. Before entering the College, she requires you to complete a test by casting a spell. 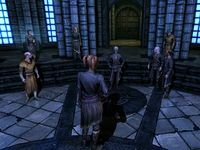 You can use persuasion or reveal that you are Dragonborn to avoid the test (although, the dialogue option to do so is unavailable if you have not yet met with the Greybeards, even if you know more than one Shout and can demonstrate one in her presence without angering her), but it may be advantageous to take it. Faralda will randomly choose a spell for you to cast, and if you do not have the spell, she will sell it for only 30 gold. Possible test spells are Healing Hands, Magelight, Conjure Flame Atronach, Fear, and Firebolt. 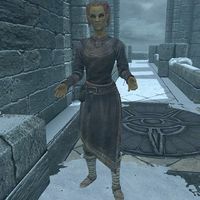 When retiring for the evening, Faralda can be found in or near her room in the Hall of Countenance, first room on the right. She wears master robes of destruction and a pair of boots. She can cast the Alteration spell Stoneflesh, the Destruction spells Chain Lightning, Lightning Bolt, Lightning Cloak, and Thunderbolt, and the Restoration spells Close Wounds and Steadfast Ward. Containment: Deal with the aftermath of the Eye's power surge. This is the merchandise found in Faralda's merchant chest. These items are only available if purchased from the merchant; they cannot be pickpocketed or stolen. They are restocked every two days. Faralda reappears in Legends as the card Destruction Tutor. This page was last modified on 13 March 2019, at 22:35.